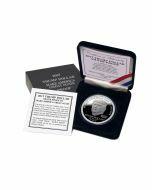 The special “First Day of Issue” (FDI) of the Trump Dollar – Certified with a hand stamped hallmark – was issued to commemorate the issue of the Trump Dollar at the Trump Dollar on April 27 in New York City. The limited edition was originally issued for $35 which quickly moved to $45 when demand quickly outstripped supply and then to $55, then $70. 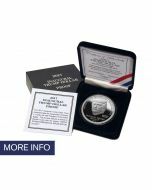 This unique, highly collectable issue is now $105 and sure to continue to appreciate due to the very few limited First Day of Issue dollars that were personally hallmarked by Bernard von NotHaus the monetary architect of the Trump Dollar. Order yours today to ensure your prestigious First Day of Issue Trump Dollar for only $105. The special First Day of Issue of the Trump Dollar – with a hand stamped hallmark – was issued on April 27 in New York City for $35. It is now only available from the secondary market for $105. This unique sought after issue will continue to appreciate due to the very few limited First Day of Issue that were personally hallmarked by Bernard von NotHaus the monetary architect of the Trump Dollar. A total of only 650 First Day of Issue specimens were personally hand stamped on one ounce Brilliant Uncirculated Silver Trump Dollars with a special hallmark by Bernard von NotHaus - the monetary architect who designed the Trump Dollar. 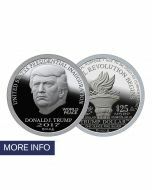 A limited number of First Day of Issue Trump Dollar specimens are now available from collectors who ordered this unique item before the Trump Dollar was issued on April 27, 2016. Each FDI specimen includes the original Certificate of Authenticity and the special engraved envelope. 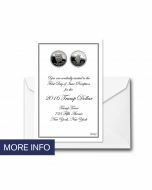 Order your prestigious First Day of Issue Silver Trump Dollar with a hand stamped hallmark today for only $105. Due to a limited supply, a limit of only two FDIs per order is available at this price. As one of only 650 Trump Dollars with special First Day of Issue hallmark, this sought after collectible is expected to continue to appreciate. What could possibly go better with the First Day of Issue Trump Dollar than the Official Invitation to the First Day of Issue Reception at the Trump Tower in New York City? The Invitation is the same size as the Card that the FDI is mounted on and also fits in the same envelope. Currently the Invitation is discounted from the original $29 and is now only $24. Limit two per order, please.